The Kivuli Project works closely with the Kenyan Children’s Department to care for, advocate for and protect children classified as being ‘in need’. This is done through the Kivuli Children’s Home, located in the central highlands of Kenya. The Kivuli Project believes that a family environment is the best for a child’s social and emotional development. 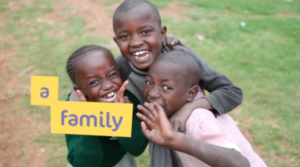 As poverty and ill-health are common causes for the separation of a child and their family, part of the work of Kivuli Children’s Home involves creating conditions where a child can return to live with relatives or join a foster family. This may require various types of support to empower the caregivers to raise the child without outside assistance. Where this is not possible, or whilst this process is taking place, Kivuli Children’s Home provides a family-like home for the children in its care. In the near future, the work of the Kivuli Project will expand beyond Kivuli Children’s Home. Kivuli Project will be working with its community to combat problems that contribute to children being ‘in need’. Hear Dee Rutherford interviewed about the Kivuli Project on radio show OpenHouse with Leigh Hatcher.